The Goodwill this holiday weekend brought me two more classics I'd never seen before: Anatole and Anatole and the Cat. On our first reading, even my four-year-old made the Ratatouille connection. I know not whether this book actually inspired the film, but it hardly matters... 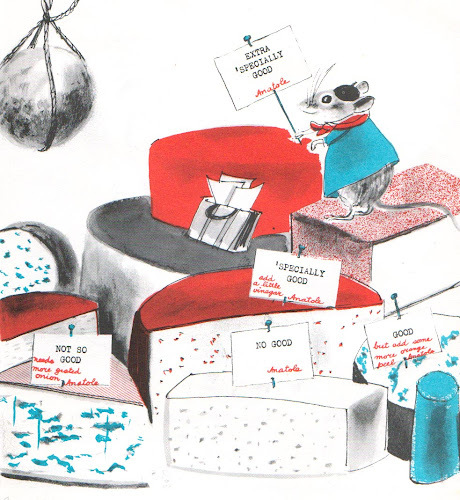 I imagine in a city like Paris there is room for more than one culinary connoisseur of the rodent kind. Sooo, there's this adorably French daddy mouse, replete with beret and smoking jacket. 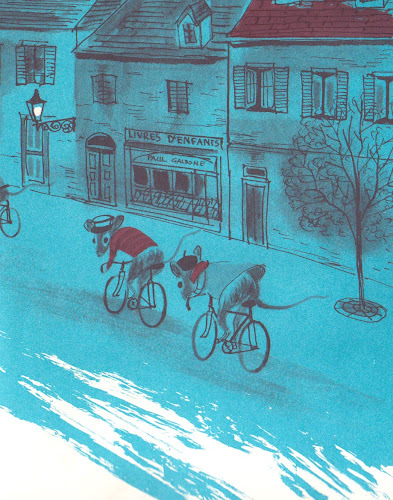 When he discovers how human beings hate mice because of their thieving ways, he is aghast and devastated. Doucette comforted him. "You are so right, Anatole," she said sadly. "If only we could give people something in return-- But alas, that is impossible!" Anatole jumped up and danced Doucette around the room "Impossible? Perhaps not ma petite! You have given me an idea." His idea is to sneak into a cheese factory and leave little notes atop cheeses with helpful hints on how to make the flavors better. To which he wins kudos of praise and is invited to eat freely from the factory's stock for the rest of his life-- a common thief no more. 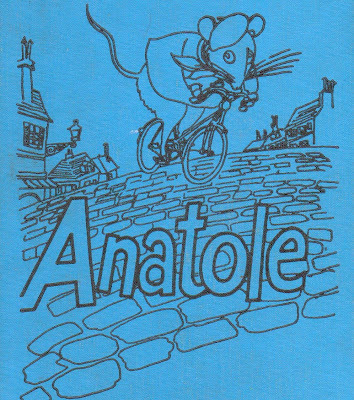 I know there are at least 10 books about the little mouse Anatole but this was the first time I'd ever run into any of them. Some of Paul Galdone's other titles scare the crap out of my son (don't even mention the book Henny Penny in my house... seriously). I think it's just his illustration style, but my son gets the creeps from a few of his characters. (I, too, can admit Puss and Boots used to scare me when I was little.) However, Anatole is just lovely. The tri-color pictures are dainty and sweet. Definitely my favorite. 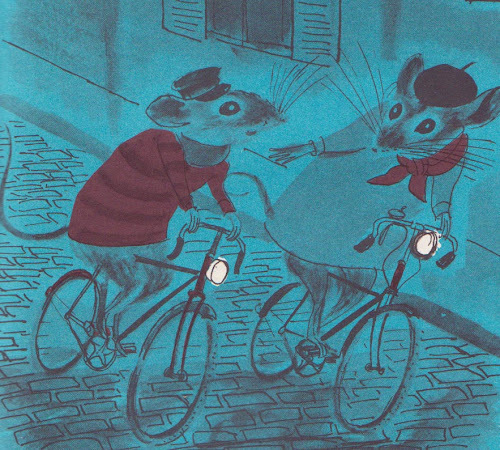 Particularly the drawings of the mice riding their bikes through the city in the blue of the night. I also love any book that fashions animals communicating with people through the keys of a typewriter. How cool would that be? Wow, I can't believe you thrifted Anatole! I've been on the look out for these for quite a while. Any idea if these were ever in French or not? Oh, I LOVED the Anatole books when I was a kid--thanks for the reminder! my sibs and I LOVED Anatole - I've been looking for them ever since my little one was born! My favorite part of Anatole is the list of Anatole's kids' names: Claude and Claudette, Paul and Paulette...who else is there? I had a bunch of Anatole books growing up. I remember loving the pictures. I still have my original "Anatole" and it has a record in the back of the hardcover (scratched, but still plays). I will have to pull that out and play it for my kids. so glad the rest of you weren't deprived... i absolutely LOVE that people LOVE books from their youth. totally heartwarming.